Tired of switching back and forth between Microsoft Outlook and LinkedIn? Lucky for you! LinkedIn has developed a special tool that automatically ties into its website. This Social Connector tool appears as part of the Microsoft Outlook screen and provides tools to make your life easier. Go to the LinkedIn home page, scroll to the bottom of the page and click the Tools link. From the Tools screen that appears, click the Outlook Social Connector tab. 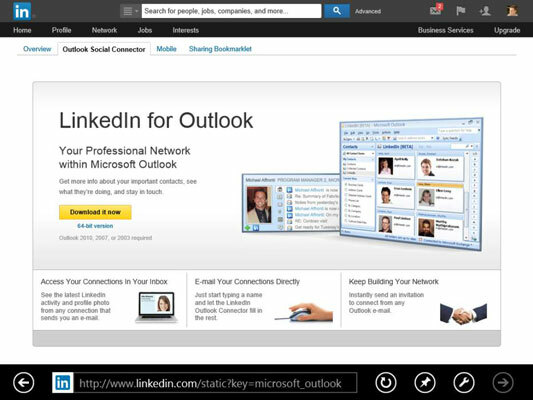 The Outlook Social Connector screen appears. Click the Download It Now button. When the LinkedIn Outlook Connector Setup Wizard opens, click Next. Review the License Agreement on the page that appears and then click the I Agree button. In the Choose Install Location screen that appears, accept the default location (recommended) or pick a new directory to install the toolbar program; then click Install to start the process. LinkedIn installs all the necessary files for the Connector tool onto your computer. Allow at least a few minutes for this process to be completed. When the tool is installed, and you’ve restarted Microsoft Outlook, a Build Network Wizard window appears. Click the Start button and follow the steps to have the Social Connector tool scan your Outlook program for contacts. You can send an invitation to these contacts to join your LinkedIn network. If you already imported your Microsoft Outlook Address Book into LinkedIn, going through the Build Network Wizard might not result in a lot of new contacts, but this process can find contacts you might not have saved to your Outlook Address Book.